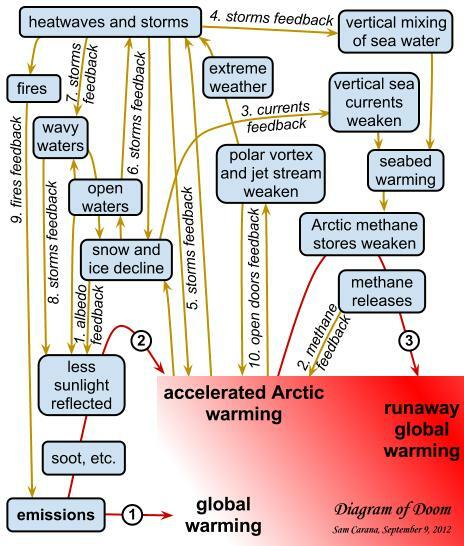 Above diagram was part of a poster displayed at the 2011 AGU meeting in San Francisco by the Arctic Methane Emergency Group (AMEG). It was accompanied by the following text: In the Arctic, three problems are compounding one another: emissions causing global warming, sea ice loss causing accelerated warming, and methane releases further accelerating Arctic warming, with the danger of triggering runaway global warming. Emissions by people causing global warming, with temperatures rising around the globe, including the Arctic. Soot, dust and volatile organic compounds settling down on snow and ice, causing albedo change. More heat is absorbed, rather than reflected as was previously the case. This causes accelerated warming in the Arctic. Accelerated warming in the Arctic threatening to weaken methane stores in the Arctic with the danger that methane releases will trigger runaway global warming. Albedo feedback: Accelerated warming in the Arctic speeds up sea ice loss, further accelerating albedo change. Methane feedback: Methane releases in the Arctic further add to the acceleration of warming in the Arctic, further contributing to weaken Arctic methane stores and increasing the danger that methane releases will trigger runaway global warming. 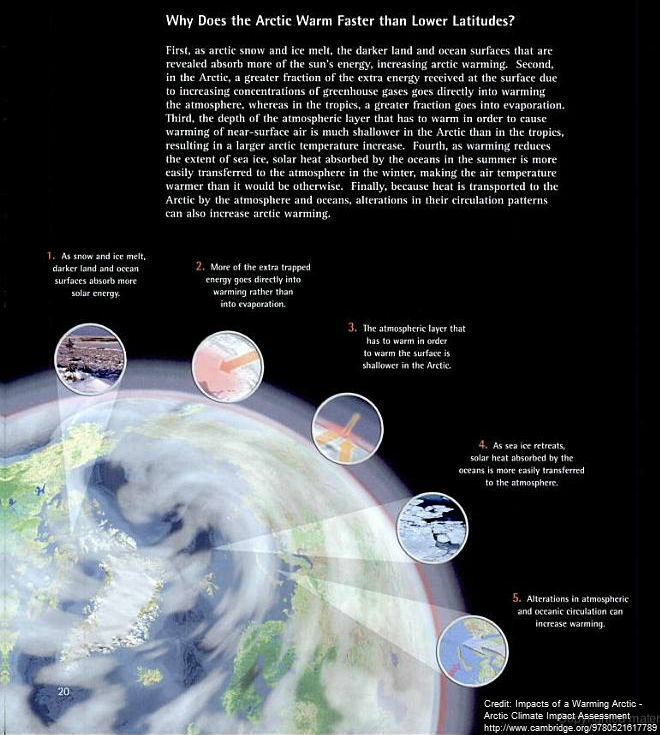 Albedo change in the Arctic comprises a number of elements, as depicted in the image below, from the 2004 report Impacts of a Warming Arctic - Arctic Climate Impact Assessment, by the International Arctic Science Committee. As described in various posts at this blog over time, there are further points that should be taken into account. Regarding sea ice loss, it's clear that where sea ice retreats, more open water appears, with the result that less sunlight is reflected back into space. Accelerated warming will also affect the integrity of the remaining sea ice, as well as of the snow and ice cover on land, including glaciers. This further adds to the albedo effect, causing less sunlight to be reflected back into space. Similarly, further feedbacks could be added or described in more detail. Albedo feedback: Accelerated warming in the Arctic speeds up the decline of ice and snow cover, further accelerating albedo change. Currents feedback: Sea ice loss can cause vertical sea currents to weaken, reducing the cooling effect they had on the seabed. This can thus further cause sediments to warm up that can contain huge amounts of methane in the form of free gas and hydrates. Storms feedback: Increased frequency and intensity of storms can cause substantially more vertical mixing of the sea water column, causing more warming of the seabed, thus further contributing to the warming of sediments, as above. Storms feedback: Accelerated warming in the Arctic can result in more storms, causing mixing of cold Arctic air with warmer air from outside the Arctic. The net result is a warmer Arctic. Storms feedback: More open waters can result in more storms that can push the ice across the Arctic Ocean, and possibly all the way out of the Arctic Ocean. Storms feedback: Storms also cause more waves that break up the sea ice. Smaller pieces of ice melt quicker than large pieces. A large flat and solid layer of ice is also less susceptible to wind than many lighter and smaller pieces of ice that will stand out above the water and capture the wind like the sails of yachts. Storms feedback: Storms cause waters to become more wavy. Calm waters can reflect much sunlight back into space, acting as a mirror, especially when the sun shines under a low angle. Wavy waters, on the other hand, absorb more sunlight. Fires feedback: More extreme weather comes with heatwaves and storms. Thus, this is in part another storms feedback. The combination of storms and fires can be deadly. Heatwaves can spark fires that, when fueled up by storms, turn into firestorms affecting huge areas and causing huge amounts of emissions. Storms can whip up particles that when deposited on ice, snow or the bare soil, can cause more sunlight to be absorbed. Open doors feedback: Accelerated warming in the Arctic causes the polar vortex and jet stream to weaken, causing more extreme weather and making it easier for warm air to enter the Arctic. These ten feedback are depicted in the diagram below. There is consensus of opinion in favor of having change happen so mean temperature anomalies don't continue upward trek. At least among living non-corporate and pecuniary interests -that Alteration of Contact law, -of valuation of money, -of concept of real and doable. -Potential exists to adjust the world system of enterprise and to do so swiftly without war in a way that tries to leave no one stranded or forgotten and which can essentially lift the burden of fear. Fun is the antidote to not successfully knowing that this is a test, one that can be passed -but it will take a Sea change and great bravery. Arctic does not exist in a vacuum nor does life. The concept of religion, of the expansion of net schism needs adjustment as it too is heat form. There is a showdown between life and physical properties of elements, open and closed case. There is no greater honor than to be alive now. The little guys have to win this one and will..
the really impressing thing is that people continue to drive their cars as nothing was happening. media do a very good job at hiding the cliff where we are plunging. Of course. What is arrogance if not arrogant. It will take an organization such as the DOD to unwind the people of all the spin that has been applied. The DOD has been working on it's own Climate Change preparations for years. The DOD might not be considered the best organization to respond but I would say that it is uniquely situated (world wide) mobile (land, sea and air) and commands respect and expects discipline. Yes, the DOD tries to be well informed, as is evident from the October 2003 report An Abrupt Climate Change Scenario and Its Implications for United States National Security, which was also reported in the Guardian, as you mention. Submarines have kept the military well informed about Arctic sea ice demise, even before the satellite era. Wieslaw Maslowski, from the Naval Postgraduate School, Monterey, CA, projected back in 2007 that Arctic summer sea ice would be gone by 2013. Meanwhile, there have been many further worrying studies and reports, as this blog has reported over the past year or so. Sadly though, it appears that the DOD remains focused on fighting people, rather than fighting climate change. DOD, Department of Defense was to brief the US President last week on Arctic sea ice melt off and its implication. Homeland Security was involved and brought specialists but the meeting was not generally reported in the US Press, nor was it spoken about by the US government. Here is link to Guardian article that contains link to Australian info. http://www.guardian.co.uk/environment/earth-insight/2013/may/02/white-house-arctic-ice-death-spiral If this is what happened it is obvious that the defense of corporate profit is held higher than that of Earth. Carlos Duante, who was mentioned in the Guardian article, says that there was indeed a meeting in Washington, but that it was a regular research meeting, not involving any of the agencies or persons mentioned, nor discussing any dramatic, imminent event, nor providing advice to the US administration. Nonetheless, I do believe it's high time for President Obama to take a closer look at the situation in the Arctic, e.g. by reading this post on methane hydrates. Time to shout loudly to get President Obama to act? -- assuming, of course, that it's not already far too late. I've read that actions by the Lucy &Haarp projects will be using laser beams to convert methane into hydrogen in Arctic Sea; in this process wont there be a tremendous amount of heat generated; and wont that cause major problems in global weather? Lasers and beamed radio waves have been suggested to help decompose methane over the Arctic Ocean and to help produce hydroxyls. It seems obvious that when the necessary energy is generated by clean technology such as solar panels, it won't add to local or global warming. Nonetheless, it should be added that any such proposals still require a lot of testing, including their energy needs and ways to generate such energy.